The info label mentions RPM as 33, but that is incorrect: both sides play at 45 RPM. When it comes to sonic audio assaults, few things compare to the power of listening to ‘Acperience 1’ in the sweaty confines of The Orbit in Morley in 1992. As an 18 year old kid taking my first steps into clubland proper… the music, and the reaction it invoked from the crowd blew my head sideways - it was almost shamanic. Its impact on the ears is still profound nearly twenty five years later… Much like Moroder’s “I Feel Love”, it is unlikely to ever date or sound ‘old’, largely due to its simplicity in structure and production. Even though the Chicago boys did it first, Hardfloor should be given credit for adding a new layer to the Acid template. To my ears it sounds better pitched down slightly (the BPMs in the early to mid 90’s got way out of control, and the trend for macho, hard, fast techno would turn me off the genre for some time)… but that aside, this is a truely spellbinding piece of club music. So boring - buildup to almost no-where. I was there at this time and if this song was played for long I would be twiddling my thumbs. I don't know what's is so special about Acperience? The only good track is Acperience 1 the others are filler. This only made the acid sound overused after this poped out as we all know that the "acid sound" has been experimented to death. 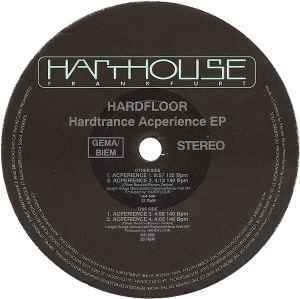 Hardfloor did nothing special except bring the sound a bit more mainstream. I agree with these 2 reviews above, although I always found it really hard to mix Acperience 1 because after the long breakdown the BPM increase a little bit and I would always forget this... anyway, it was such a classic that people would be bouncing off the walls when it got played so there was no need to mix out quickly anyhow! Definately a genre defining record and a classic to boot. I haven't heard it for some time but I'll dig it out again soon. Essentially ‘Acperience 1’ didn’t feature anything new. Acid had been done to death in the late 1980s, notably in Chicago, Detroit, London, and Manchester. All the sounds and samples used on ‘Acperience 1’ had been heard before, and this track even bears more than just a passing resemblance to ‘Acid Thunder’ by Fast Eddie. Yet when this E.P was released in 1992, no one had ever heard anything quite like it before, and in the years to pass this has proved to be possibly the most influential dance record released in the 1990s. ‘Acperience 1’ builds with ominous pounding kick drums, becoming meatier as the distinctive groove builds. The bass line drops in, and echoed clicking samples are expertly woven in as the acid drawl starts to make an appearance. The track builds and builds, adding layers, and becoming growlier and the 303s ever more tweaked. The caries on for several minutes, captivating the listener into a groovy hypnotic trance. The track then breaks for the most famous of breakdowns. It is here that the track truly reveals itself. A high pitched tonal atmospheric synth line which up until then had been running unheard in the background now comes to the fore. This builds the tension, which eventually erupts in a hail of huge snare rolls that even Wagner couldn’t have imagined. The track comes back with a vengeance and let’s rips with 303s tweaked to frequencies that could split a diamond in half. Finally it all comes crashing down for the cliff-hanger finale and winds itself down with superbly echoed acid bubbles and bleeps aplenty, until all that is heard is that tonal atmospheric synth line again. Perfect listening for the home and the dancefloor. It would take a very brave or foolish DJ to mix this one out. So many years down the line, and ‘Acperience 1’ has not aged one iota. Thanks to its simplicity and masterful production, it probably never will. Look out for the live performance of ‘Acperience 1’ that Hardfloor did for MTV Europe. It features a slight rearrangement, some echoed ‘Acid Acperience’ vocals at the intro, and extra tweaking at the end. Watching them at play with their hardware, you’ll also be able to appreciate the technical wizardry that went into this producing track. A note to anybody learning to mix. At a definite 125bpm with steady and well defined beats, ‘Acperience 1’ is the perfect track for learning beat mixing. Buy yourself two copies. Whereas ‘Acperience 1’ is an acid trance track that is most cherished by the techno fraternity, the remaining tracks on this E.P veer away from trance. ‘Acperience 2’ is mechnaoid acid techno. It boasts meaty but flat rattling deep technoid beats with tripomatic hints, quirky jazz soundscapes, and the 303 is of the drippy variety. ‘Acperience 3’ is raw acid house, much like the sort of material that would later be released on the Important imprint. This track is possibly a bit dated now. ‘Acperience 4’ is the fastest track on this E.P, and has a quick corrosive acid line over meaty banging beats. In typical Hardfloor fashion, this track displays some quirky behaviour, and would suit those latter set moments. The only criticism I could level at this record is that it wasn’t released as a double 12” pack as it so obviously deserved to be. This is the sort of record that changes people’s lives.